Many a times you just need to identify a particular folder regularly and urgently. How often has it happened that you find your eyes running over all the folder names and yet not being able to find that particular one!? Else you can also try giving your folders a different color. 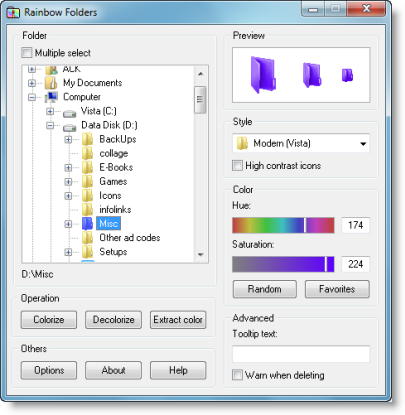 Rainbow Folders is a nice program that allows you to change the color of folders right from the context menu. This is a versatile program and can be used in so many ways. For example you might denote all of your work folders with a red color to visually differentiate them from other folders. In short, with this program you can colorize your folders and speed up your navigation among the hundreds of folders located on your hard drive. Rather than offer you a limited number of colors, it lets you use a hue to make an unlimited number of shades.